WASHINGTON (AP) - Attorney General Jeff Sessions on Monday warned so-called sanctuary cities they could lose federal money for refusing to cooperate with immigration authorities and suggested the government would come after grant money that has already been awarded if they don't comply. Sessions said the Justice Department would require cities seeking some of $4.1 billion available in grant money to verify that they are in compliance with a section of federal law that allows information sharing with immigration officials. His statements in the White House briefing room brought to mind tough talk from President Donald Trump's campaign and came just three days after the administration's crushing health care defeat. Sessions also acknowledged he was clarifying a similar policy adopted by the Obama administration last year. 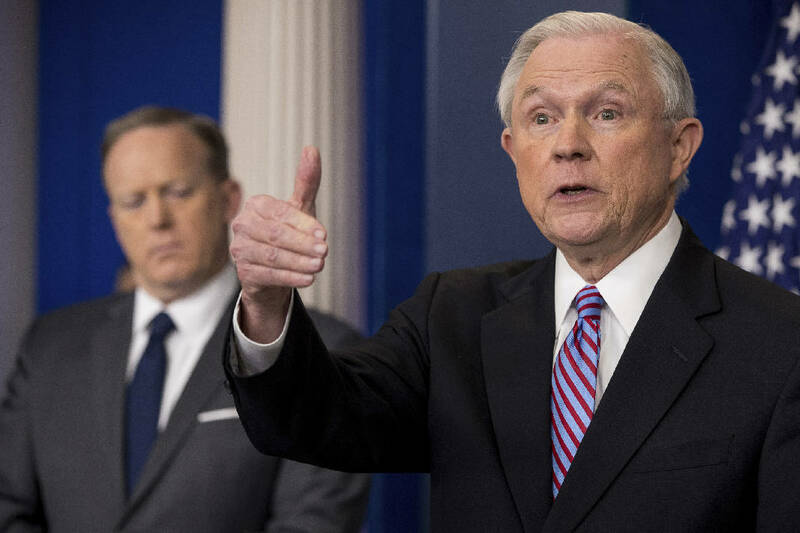 "I urge the nation's states and cities to carefully consider the harm they are doing to their citizens by refusing to enforce our immigration laws," Sessions said. Trump had said during the campaign that he would "defund" sanctuary cities by taking away their federal funding. But legal precedent suggests that would be difficult. Sessions' message came days after the administration released a report on local jails that listed more than 200 cases of immigrants released from custody before federal agents could intervene. That list was compiled following an executive order Trump signed in January that called on the government to document which local jurisdictions aren't cooperating with federal efforts to find and deport immigrants in the country illegally. Meanwhile, municipal leaders gathered in New York vowed to defy Trump's crackdown as they gathered for a small conference that attracted officials from cities including San Francisco, Seattle, Denver, Chicago, Philadelphia and New York. "We are going to become this administration's worst nightmare," said New York City council speaker Melissa Mark-Viverito. Mark-Viverito and others promised to block federal immigration agents from accessing certain private areas on city property, to restrict their access to schools and school records and to offer legal services to immigrants in the country illegally. City officials were also encouraged to embrace their rarely used oversight and subpoena powers to investigate federal immigration practices.